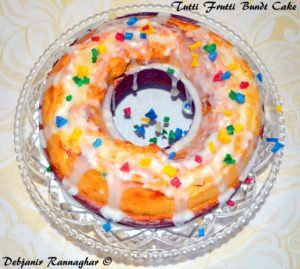 After preparing Tutti Frutti (click for recipe and further details) last week, I was searching for an opportunity to use those in cooking as well and finally used those in a Tutti Frutti Cake on the afternoon of my birthday 🙂 ! No it was not my Birthday cake but a Return Cake for my little one who gifted me a Chocolate Truffle Cake this year… 😆 This year I took leave from work and was at home with Pasta… We had a typical Bong lunch with Bhat, Ghee and Aloo Shedho ….I fnally started with baking the Tutti Frutti Cake for my sweetheart …. 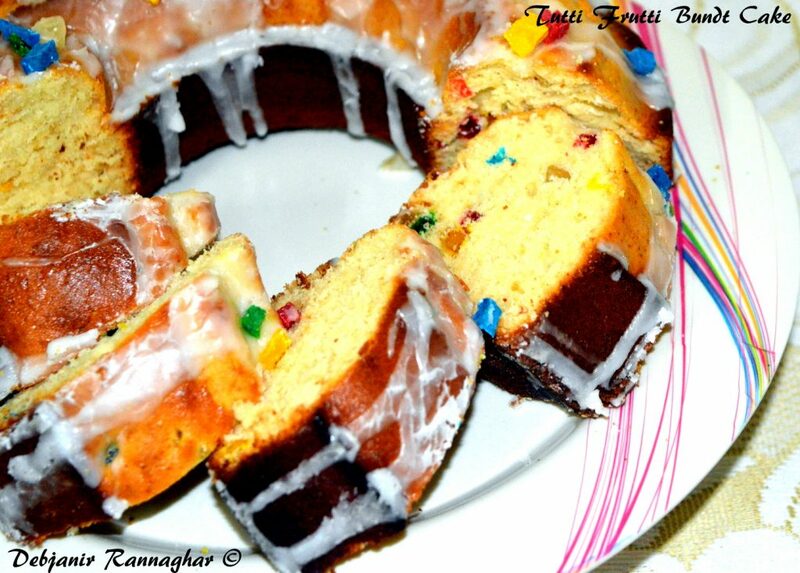 I mostly use Whole Wheat Flour instead of All Purpose Flour for Baking and try to substitute Butter with Vegetable Oil but this time I was in a mood to prepare a rich and royal cake with dominant Indian flavour and hence opted for adding Tutti Frutti in my cake and also used Condensed milk to make it more RoyaI. 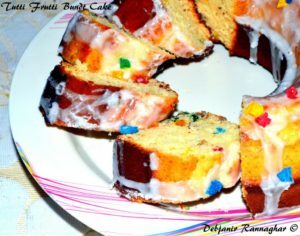 Initially I was planning to make Cupcakes but then decided to use my Bundt Pan which I’ve not used since long….Last but not the least I have used Homemade Tutti Frutti in my cake! 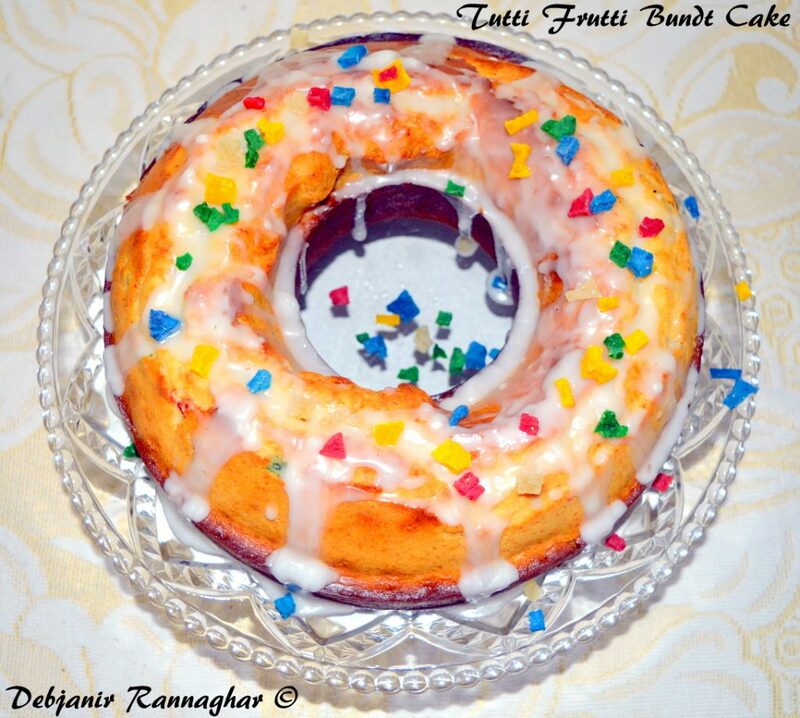 A simple yet Royal Indian Cake loaded with Tutti Frutti and Glazed with a mixture of Icing Sugar and lemon Juice along with a Cup of Coffee (little one was having milk with her portion of Cake)…. It was a relaxing Birthday evening of mine….and after that Hubby taken care of rest of the cake! All the ingredients required to be in room temperature before mixing. Pre-heat the oven in 180 degree C for 15 minutes. Mix All Purpose Flour with Baking Soda and Baking Powder and then Strain the mixture using a Strainer 2 times. Take 1 Tbsp. Flour mix and mix that with Tutti Frutti properly and keep the mixture aside. 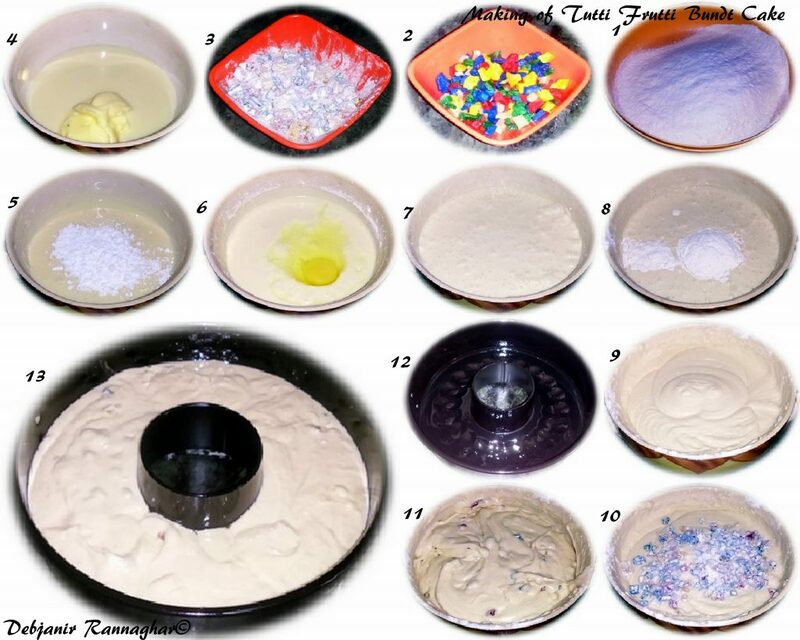 This step is required before adding Tutti Frutti to the Cake mix to not to allow those to set in the bottom of the Cake tin. Take Butter in Room Temperature along with Condensed Milk in a Bowl and beat those in medium speed to get a creamy mixture. Add Sugar to the mixture and beat for around 1 minute until Sugar dissolves completely. Add Eggs one by one to the mixture and continue beating till the mixture turns fluffy and creamy. Add Vanilla essence and mix that too. After this step there is no need to beat the mixture much. Add 1/3 of the Flour mix to the Wet mixture and using a Spatula mix Flour using Cut and Fold method. Don't overmix. Add remaining Flour in 2 batches and complete mixing. Now add Tutti Frutti coated with Flour to the cake mix and fold lightly. Now coat the Bundt Pan (or the pan you are using for baking) with little oil and Pour the Cake Mixture carefully and Bake the Cake in 180 Degree C for 25-30 minutes. It took me 25 minutes to bake the cake. Check the Cake after 20 minutes and insert a tooth pick to check whether the cake is done or not. Take the Cake out of the Oven and Cool it in a wire rack. 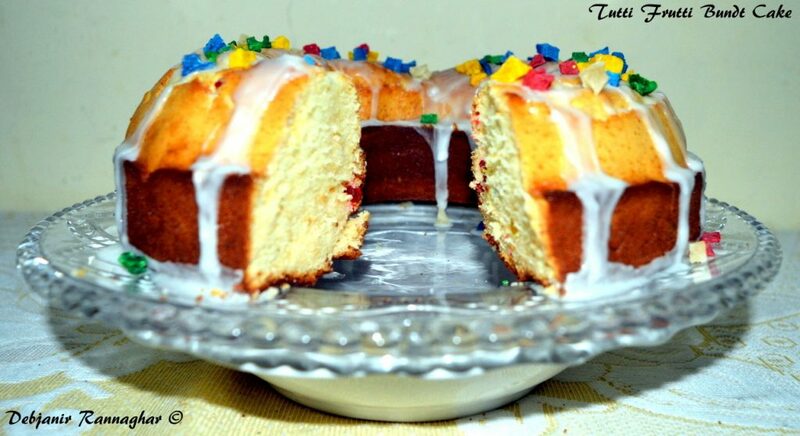 Mix Icing Sugar along with Lemon Juice to make a creamy Glaze. If required add very little water. Top the Cake with the Lemony Glaze and sprinkle Tutti Frutti Over the Cake and Slice it in to desired portions. 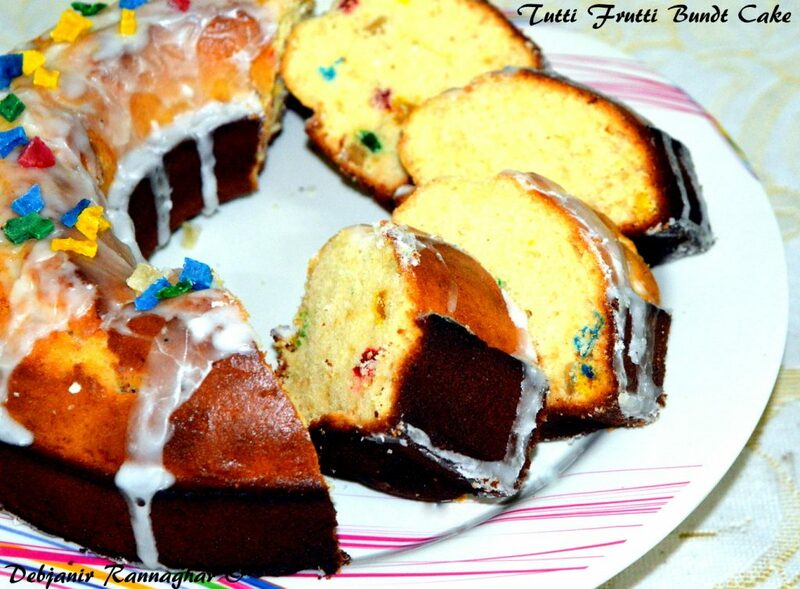 Soft and spongy Tutti Frutti Cake slices are ready to serve! « Pasta’s Colour Game with multi-coloured Tutti Frutti!